Sculpting a lifelike image out of clay or stone sounds like so great a challenge we can barely grasp it. But rendering such a likeness from a pile of recycled books? That's taking the challenge to a whole new, and quite literary, level. Let artist Long-Bin Chen show you how it's done. The gifted book sculptor eschews clay in favor of more unorthodox materials such as telephone books, magazines and other used paperbacks. Chen transforms these recycled books from sites of information into purely physical entities, their words and messages becoming irrelevant in comparison to their soft pages and gentle texture. Blending Western knowledge with Eastern tradition, Chen shapes his expired bookshelves as Buddhas, warriors and other Asian icons. The repetition of Buddha heads has a particularly important connotation. Explained the Hasley Institute of Contemporary Art: "The Buddha sculptures represent the missing heads of many ancient Buddha figures that have been looted from Asia and sold to Western museums and collectors. Since colonial times, Westerners have taken heads from the Buddha statues in Asia and brought them back to the West." Chen's enchanting sculptures, which from afar look to be made of stone or wood, require a second, third or perhaps fourth look before truly revealing themselves. With each book creation, Chen acknowledges the wastefulness of contemporary western society as well as the looming omnipotence of the digital age. One day, Chen's busts seem to predict, technology will make paper books as obsolete as the ancient busts they imitate. 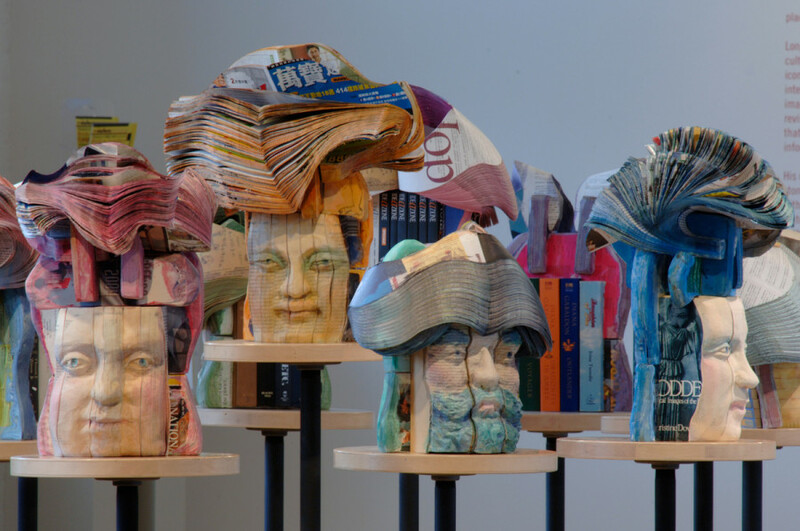 See Chen's transfixing book sculptures below and let us know your thoughts in the comments.